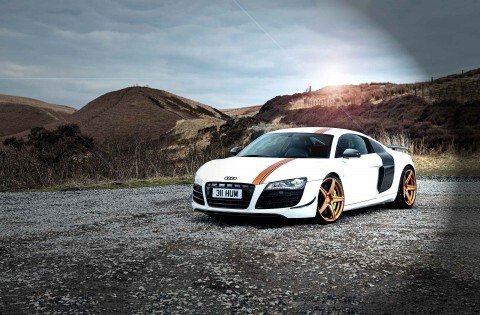 Improving on Perfection Not many R8 owners feel the need to tinker with their fiery steeds. But with some bespoke styling and a Heffner twinturbo conversion on its V10 engine, Ben Haider’s stunning example proves that it’s well worth biting the bullet… Words Sam Preston. Photography AJ Walker. Back in 2006 the first-gen Audi R8 really should have been a massive hit – mid-mounted dry sump 414bhp 4.2 V8 32V engine, alloy spaceframe and monocoque, carbonibre cradle plus 0-60mph in 4.6 seconds and 187mph. Virtually hand-built at the Nekarsulm factory and sharing the Lamborghini Gallardo platform, only 28 R8s were made every day. This was a low-volume alloy supercar with four-wheel drive that was as reliable as a Golf. Yet only 164 R8s were sold globally in 2006, 4175 in 2007 and then, thanks to the 2008 recession, production tumbled to 2101 cars in 2009. The R8’s problem wasn’t only the financial environment into which it was born – it was just too clever and cerebral to catch the market’s imagination. Audi’s minimalist Bauhaus design grammar may have been fine for a TT, but for £77k before options, buyers wanted something that shouted a little louder. In many ways the R8 was too invisible, too quiet and too restrained. Back in those midmillennium glory days buyers preferred their supercars to wear prancing horses or bulls on their noses. But for collectors those early cars aren’t just worth seeking out because of their rarity – there are only 400-odd 2006-2007 R8s in the UK – they look howling value for money. Tradepricecars in Essex has a Silver ’07 with just 25k for £39,750 – or half the price of a very average Pagoda Merc. A private seller in Swindon has a black 2007, also with 25k, for £34,995 and it comes with £12k of factory options and full Audi history. That has to be one of the cheapest low-mileage supercars you can buy. Despite that prodigious top end those 4.2 R8s don’t feel properly ballistic – for that you’ll need the later V10. At 150mph things feel very stable and even exploring 180mph territory isn’t that scary. This is a well-planted and secure machine with a sublime ride. You’ll love the three turns lock to lock hydraulic steering but avoid the carbon brake option because they’re too grabby. I’d stick to the conventional six-speed manual because the sequential R-tronic isn’t as much fun. As a future classic a 2006/2007 UK rhd R8 could be a clever buy. They’re rare, respected, exclusive and technologically awesome. Find one of the very few 2006 #launch-year-examples and you’ll have something that’s already collectible. What’s more it’s a genuine supercar that doesn’t make you suffer to own and enjoy. 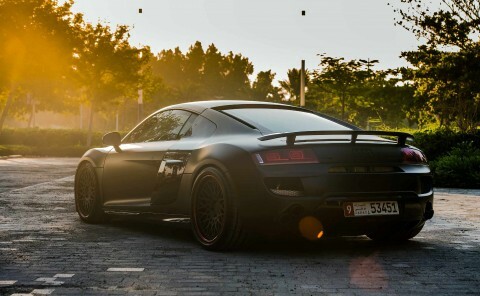 Middle East Feast Audi R8 V8 Typ 42 485bhp Feast your eyes on this magnificent R8 loaded with an impressive 480 odd Arabian horses. Words Jay Bee. Photography Brian Maroney. We test Push Performance's insane, R8 V10 twin-turbo R8S head to head. Twin turbo versus supercharged. Words Davy Lewis. Photography Davy Lewis and Matt Dear.